The MBA program was launching a new online program and I was asked to lead the instructional design efforts for these courses. Since we were involved early on before course development started, I saw this as an opportunity to create some consistency across courses, both visually and pedagogically. At the same time, many of the professors in the Online MBA program had no experience teaching online so I wanted to create a resource that would walk them through best practices in online instruction, while also serving as a starting point for their course development. I created a Moodle course shell that includes instructional templates (syllabus template, welcome letter template, etc. 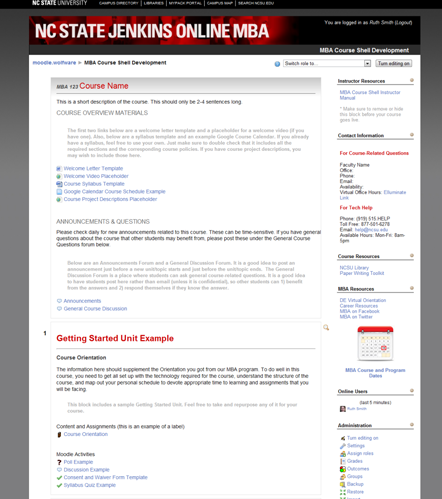 ), design templates (pre-populated web pages with custom MBA branding) and content and assignment examples from other courses so they could explore early on what some of the possibilities might be. The shell can easily be imported into individual course spaces as a starting point for instructors to work from. The shell also includes links out to program-level resources that are consistent across courses. I also worked with a technical writer to create an instructor manual on how to use the various components of the the MBA Course Shell.